What Motivates Public Figure Attackers? Public figures – celebrities in the entertainment, sports, and media world, high profile “celebrity” CEOs, and others – run the risk of fixation, stalking, and threats by individuals with various motives. In our consulting work, the question is, how can we identify those who may pose a risk of physical harm to their targets? In this feature, Reid Meloy discusses his important new research in this area. In 2016 FBI Supervisory Special Agent Molly Amman and I completed a study of public figure attackers in the United States between 1995-2015. Our attempt was to update the work of the Exceptional Case Study Project conducted by Dr. Robert Fein and Bryan Vossekuil while with the U.S. Secret Service. We wanted to see what had changed and what remained the same. We were able to identify 56 cases of public figure attacks involving 58 perpetrators and 58 victims, and did a deep dive into the publicly available information on each incident. We believe these are likely to be all the cases during this 21year period of time. The entire study is available in PDF on my website at DrReidMeloy.com, and was published in Behavioral Sciences and the Law (DOI: 10.1002/bsl.2253). The most striking finding in our study was the virtual absence of a desire for fame or notoriety among the perpetrators. This finding was only suggestive as there were no clinical interviews to probe for such motivation. However, the fact that only one of the 58 offenders—Andrew Cunanan who murdered Gianni Versace in Miami Beach, Florida in 1997­—indicated any such motivation is in stark contrast to the finding in the ECSP study. Fein and Vossekuil (1999) found that attention-seeking and notoriety were a motivation in 38% of their incidents (n = 74). We think that it may be less necessary than in the past to engage in assassination in order to become infamous. The Internet and social media make it possible for anyone with access to technology to achieve fame with little effort. Trending Facebook, Twitter, or YouTube topics regularly make national television newscasts, and virtually anyone can attempt to step into the spotlight by live streaming, podcasting or posting their opinions or activities. This change, moreover, did not appear to be the result of limited data, as other motivations, apparently more personal and angry, fueled the attacks: rejection, ongoing disputes, retaliation, dissatisfactions, and other general emotional distress. In some cases these were apparently caused by psychosis. These five motivations accounted for 77% of the 43 offenders where we could determine motivation. Public figure attackers are different. Here, instead, we see “retaliation and survival.” There is clearly a desire to strike back against a perceived wrong, end an injustice, retaliate for a rejection, or express profound dissatisfaction, but there is not a desire to obliterate the self at the same time. In fact, survival is a key element in their post-offense behavior: escape if at all possible, and commit suicide only if capture or indictment is imminent. This may afford an advantage to security personnel in that planning for escape and survival reasonably poses a greater challenge than planning for death. Visible and close security would probably deter at least some would-be attackers who will recognize that such measures lessen their chances of escape and increase the odds of them being harmed themselves. What also appears to be different is the more personal nature of the attacks on public figures over the past 20 years. One might assume this change is due to the growth of the Internet, and the acceleration of social media, wherein the attacker might feel and believe he has a personal relationship with the victim due to his remarkable access to personal information. This is not, however, just occurring in virtual reality. In this study more than one-third of the public figures personally knew their attacker. Terrestrial reality is in play. Perhaps the most plausible hypothesis is that the Internet and social media magnify the intensity of feelings, i.e., resentment and grievance toward the public figure, especially when there is an actual relationship; or help incubate the fantasy of a dysphoric and angry connection when no actual relationship exists. The pathological narcissism of public figure attackers when apparent may have shifted for some subjects from the pursuit of infamy through an attack against a famous person, to the belief that one is entitled to mount an attack given the importance of one’s grievance and resentment. This is supported by our finding of grandiosity in three-fourths of the subjects where data were available, and relates to our earlier finding of grandiosity as a strong predictor of approach to members of the British Royal Family (see our studies at DrReidMeloy.com). An inflated view of oneself, often one of the final narcissistic defenses in a depleted personality, can fuel a strong sense of entitlement. Many other findings in our study will be of interest, especially to those involved in public figure protection in corporate, university, or government settings where the workplace and its leadership have become a source of fascination—if not obsession—for some members of the public. The wavr21.com website is fully devoted to information about the instrument and its secure, browser application, The WAVR-21 Threat Assessment App. The WAVR-21 Threat Assessment App is available for licensing and is currently issued by the software developer, Resolver. For pricing and to request a demo of the app, click here click here to visit Resolver’s website. 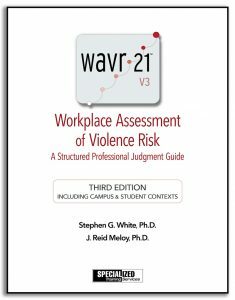 The hard copy WAVR-21 manual can be purchased from Specialized Training Services (STS). “Workplace Violence: Practical Considerations for Mental Health Professionals in Consultation, Assessment, and Management of Risk.” P. Saragoza & S.G. White. Elsevier, 2016. “The Challenge to Connect the Dots.” S.G. White. NACUA, 2009. DISCLAIMER: The information provided on this website does not constitute professional or legal advice. Readers should consult with qualified threat assessment or related specialists and their legal resources before acting on any of the information presented. © Work Trauma Services Inc.